Is your attic jam-packed with items you simply can’t bear to part with? Snapping a picture of each treasured item might make paring down your collection easier, new research suggests. The study found that people were more willing to give away unneeded goods that still had sentimental value if they were encouraged to take a photo of the items first, or find another way to preserve the memories. “What people really don’t want to give up is the memories associated with the item,” said Rebecca Reczek, Associate Professor at the Ohio State University. “We found that people are more willing to give up these possessions if we offer them a way to keep the memory and the identity associated with that memory,” Reczek added. For the study, the researchers conducted a field study involving 797 students at Penn State, where they conducted two different advertising campaigns for a donation drive. The team discovered that participants who were prompted to take a picture donated between 15 and 35 percent more than those who weren't encouraged to take a picture -- 613 items were donated in the residence halls that hosted the “memory preservation” campaign, versus only 533 in the control campaign. In follow-up experiments, the researchers found that it wasn’t just the memories associated with these possessions that were keeping people from donating -- it was the identities attached to those memories. Infant clothes, for example, might carry an association with one’s identity as a new mother or father, which could make it difficult to say goodbye to those tiny onesies. 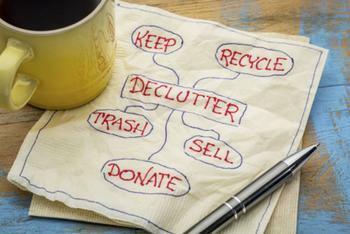 The bottom line is that everyone benefits by using this memory preservation strategy to declutter a home, the researchers said. The full study is published online in the Journal of Marketing.